The Devil Rays are now the first team to train in their home city since the Cardinals and Athletics did over 80 years ago. 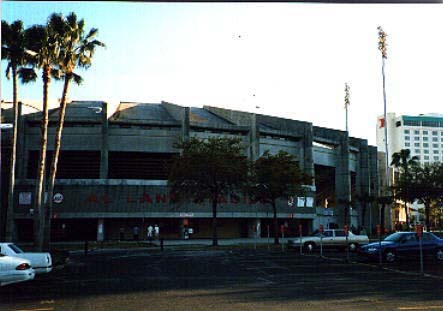 Interestingly enough, another bit of history lies with Al Lang Field: it is 84 years old! 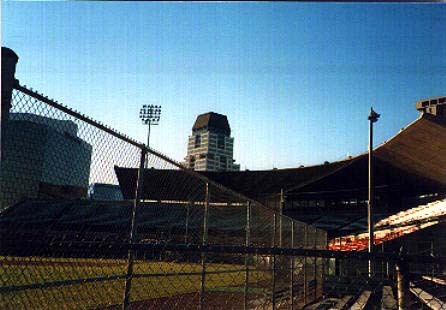 Don't fret- the stadium has been renovated several times since, including a major one just a few years ago. Al Lang Field at Florida Power Park has the single most beautiful backdrop of any stadium I have ever seen. It's pretty amazing being able to watch a game. 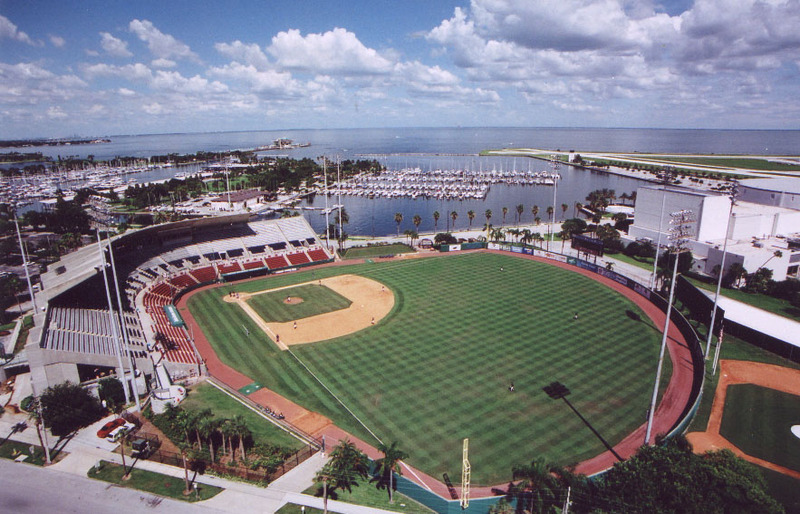 Behind the outfield, you can see huge palm trees looming and watch boats move in and out of the grogeous Tampa Bay. Think of it as Pac-Bell Park in Florida. A good think about this stadium is that it has a huge overhand that can keep the crowd pretty shady. While this may not seem significant, you'll realize its importance when you are sitting in 95 degree heat. My favorite feature of this stadium is the huge grill it has. This grill is absolutely huge and is only rivaled by the grill at the Dodgers facility in Vero Beach. Sausages, hamburgers, hotdogs, and the like are cooked right in front of you to perfection. Seats do not sell too quickly here at this stadium, probably because the Devil Rays are not exactly the greatest team in the league. On game day, tickets are sold for the two large grassy berms that are often quite popular for families with children. I have only been to the stadium once, and when I did the game was rained out pretty quickly, so my memories of the facility are not exactly the best. However, everyone else I know who has visited it on a sunnier day than my trip said they absolutely loved it. One positive thing about this stadium is that if you look at that big roof, you can tell that the fans stay pretty shady. The outside of this stadium is extremely dull and not at all aesthetically appealing. Here is a nice overhead view of the stadium. You can see the practice fields behind the right field wall and the bay to the side of the stadium. Autograph tip: I got to the stadium two hours before the game started, as I usually do, and there was hardly anyone trying to get autographs. I simply stood near the D-Rays dugout and got plenty of autographs. I've heard that the batting cages are a good place for autographs, and the team also recently made their morning practice sessions free to the public, which you may want to look in to. "Go on game day and get the "berm seats." It's a small grassy knoll on the visitors side of the field. A four-foot chain link fence separates you from the players and a makeshift bullpen. The players must pass by this berm to get to the team bus. I got numerous balls signed here, including signatures form Jeter and Big Mac."